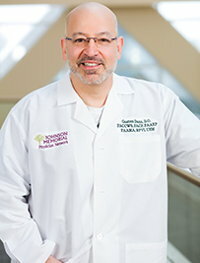 Fellow of the American College of Physicians, American College of Clinical Wound Medicine and Surgery, American Association of Emergency Physicians and American Academy of Medical Acupuncture. Gaston Dana, D.O., FACP, FACCWS, FAAEP, RPVI, UHM. Dr. Dana's certifications include internal medicine, wound care, emergency medicine, hyperbaric medicine, medical acupuncture and a registered physician in vascular ultrasound interpretation.